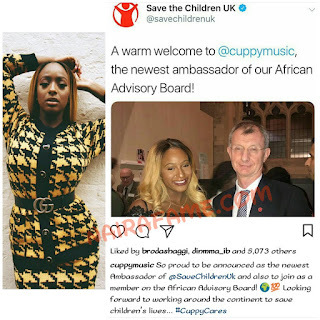 DJ Cuppy announced as the newest Ambassador of Save Children Uk - NAIRAFAME | Best Entertainment Platform. Nigerian female Disc Jockey announced as the newest Ambassador of @SaveChildrenUk and also to join as a member on the African Advisory Board! DJ cuppy also looking forward to work with them @SaveChildrenUk.